Mail Center Fun What really happens when Christmas Gifts (Packages) are Shipped! Grace and Anna taking a “foam peanut” bath! This past Christmas season was busy as usual at The Mail Center. We shipped many a present for our customer’s children and grandchildren. 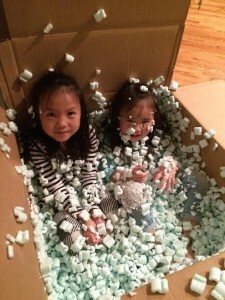 It is always fun to see what happens when the children receive their presents after they have been delivered One of our customer’s grandchildren had a really good time with not only the presents, but the packaging as well. Never underestimate the power of children to see the fun and excitement in the packaging as well as the package! I really appreciate you posting this photo of my children! We loved the picture as well and your words were a perfect companion! My family has been long time customers of yours and this type of engagement back is appreciated! Thank you! Thank you Mark for the kind response! Have a great week!